DEADLINE EXTENDED UNTIL 21 MARCH! Based in the UAE? Applications are now open for Culture Shift: Dubai dimension! The British Council are hosting a Culture Shift Lab in Dubai on the 26th – 28th March at thejamjar. We are at an exciting time for the arts and creative economy in the UAE, with countries in the region investing more money in arts infrastructure, venues, start-up businesses and events.There is currently a huge audience of young people in the region who have an appetite for exhibitions, live performances and theatre, but who also regularly look to digital media for inspiration. With this in mind, we are hosting a weekend filled with innovation and creativity, to explore how technology can be used to stimulate new ideas and solutions to some of the challenges faced within the cultural sector. Culture Shift is the British Council’s global innovation programme. A Culture Shift Lab is similar to a hack weekend; where business ideas are generated and tested over a short period of time by designers, developers, innovators, individuals and groups from the local cultural sector. Culture Shift Labs have been held all over the world including Kenya, South America, South Africa and Egypt stimulating cultural economies across the globe since 2011. To have a look at a video from Culture Hack Nigeria 2014, click here. The model has a proven track record in stimulating innovation in the cultural sector across the globe and we now bringing it to Dubai. We are aiming to develop a range of digital prototypes that will be presented to a panel of judges on the final day of the lab with as two winning ideas will receive ongoing support for sustainable development. The Culture Shift Lab is a free event and will be delivered by Snook, a leading design and innovation agency based in Scotland, UK. 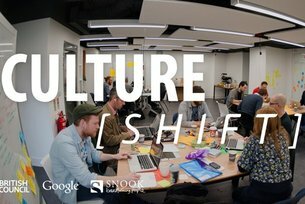 The Culture Shift Lab will take place over three days and include ice-breaker sessions, guided workshops and free development time. There will also be a number of flash talks from other digital innovators and leading figures within the cultural sector, via Skype and in person at the event. We are looking for people keen to share and collaborate on ideas who have an interest in the creative sector and digital technology. We are inviting around 40 people to attend and are seeking a diverse mix of skills and experience from design to digital development, innovators, entrepreneurs and knowledge from within the cultural sector in UAE. Prior to the event, ideas are submitted for the Culture Shift Lab which will be reviewed by the British Council and Snook. The idea owners will be notified if they have been selected and the organisers may ask that if concepts are similar to others, collaborations are made before the event. Consider how technology can be used to stimulate and create platforms for more grassroots cultural activity in Dubai. How can we aid the expansion and development of grassroots activity in the creative sectors within Dubai? We want you to consider how the solutions (digital products and services) will look like in 2020 and develop over the coming 5 years. Consider the everyday journey through Dubai of citizens to further engage with the creative industries in the home, on the street and in the workplace. How can we stimulate and find ways to open up this grassroot and cultural activity in the everyday? These can be early stage ideas or semi-formed. We’re looking for you to submit an idea that responds to our challenge and considers how it works in practice. At this stage, it is okay to not have all the answers! That is what the lab is for – but the more you can share, the better we can assess if this is ideal for the Culture Shift Lab format. It is really important that you are willing for your idea to be hacked, re-modelled and worked on by a variety of people with you at the event. It’s also important you are interested in taking forward the concept after the Culture Shift Lab, as two winning ideas will receive ongoing support for sustainable development. If you are applying as an organisation, please indicate in the submission form. We allow a maximum of two people to come together from any one organisation. If you can’t attend the Culture Shift Lab but have a burning idea you would like to see developed in Dubai, we would still love to receive them! We will choose the best ideas and will form a team to develop it at the event, on your behalf. Even if you haven’t got a idea in mind, don’t worry – you don’t have to submit a challenge to participate in Culture Shift Lab! We want to ensure a balance of talent during the Lab so are looking for people to come and join a team to support the idea development of ideas. Applications must be submitted by midnight on the 21st March 2015 and please ensure you are free to attend the event between 26th – 28th March 2015. Thursday and Saturday will run as full days from 09:00 until 18:00, with Friday being held from 14:00 – 21:00. Applications are open to participants that are based in the UAE. Snook are our innovation experts from the UK. Snook are an award winning design agency who specialise in design and innovation across the public and private sector. Over the last few years, Snook have supported British Council in running Culture Shift events in Nairobi and Cairo. They bring expertise across design, digital and business within the cultural sector. Culture Shift Dubai - the results! Sarah Drummond, Director of UK service design agency Snook, reflects on delivering Culture Shift in Dubai, how to run a hack, and how great team work can start with a fightclub!